You might say I have a slight addiction to the technology! My MacBook, iPad and iPhone get daily workouts by yours truly for many reasons, including blogging, designing, Facebook, Twitter, Instagram, Pinterest, BlogLovin and so much more. About a year and half ago, many that read my blog and know me are aware that my family was without power, not just electricity and heat, but also my internet connection. We live in NY and were in the middle of Hurricane Sandy when it happened, but thankfully we only lost power and had no real damage happened to my home, but still I couldn’t even use a phone or my iPad even just for reading a book on my Kindle app for fear that I couldn’t recharge either of these items. Well, recently I was asked to test drive the RavPower Luster Cube 6000mAh Backup external battery pac power bank charger for smartphones and tablets, too. I jumped at the chance, because I remember how inconvenienced I was during Hurricane Sandy. The worst part for me was not even being able to read a book. I seriously as I said was so afraid that I would use up all the battery power on my iPad not knowing how long we could go without power. We were told by LIPA (the local electric company), it could be up to a week. My husband works out of the home. His office got power back quickly and he would charge his iPhone and iPad at work, but I actually had to go to a local Bestbuy to find a charger compatible for both my iPhone and iPad to charge while I would drive my car around town, because I work in the home. 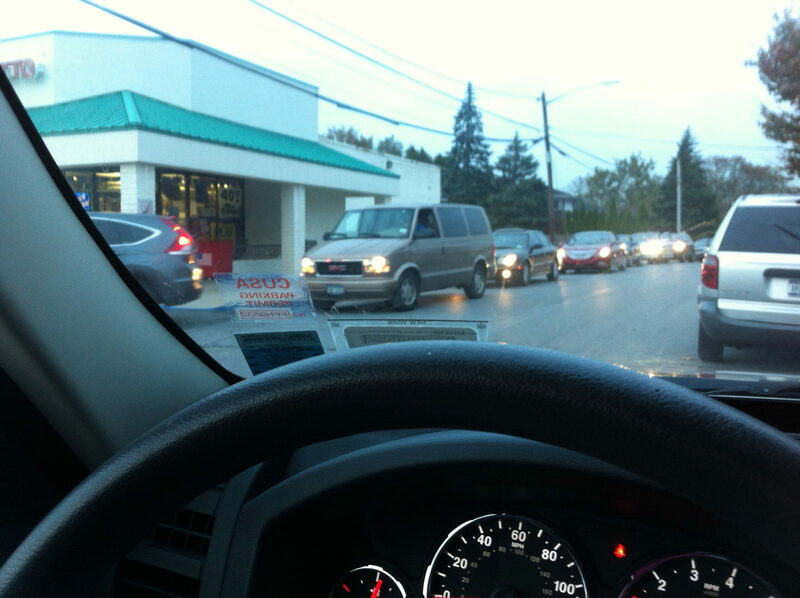 Did I mention there was a gas shortage and the lines for gas were literally around the block if a station actually did have gas! So, charging my iPhone and iPad were not an option for most of that time from both no electricity in my house and a gas shortage, as well. But now with this little gadget, barring that I had kept it charged and even had my husband take it to work to charge electrically during the day for me, I could now recharge my iPad and iPhone without having to plug either item into an electrical socket or give up my iPhone or iPad up to him to charge during the day at work. I was sold just at this concept and thought alone. Once I received and tried it, I was even happier to be in possession of this awesome power bank. Don’t believe me and want to know more? 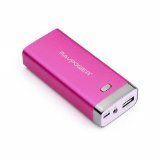 Yup, I chose the Pink RAVPower Charger! Very light and compact – it only weighs 5.05 oz. Fits easily in pocket or purse for easy traveling. Comes in multiple colors – black, blue, gold, pink (of course the pink girl chose the pink model!). Is a true time saver! A much faster way of charging your ipad, camera, PC etc. and any other 1A output devices with over-current protection than any charger you do own for said devices. A whopping 6000 mAh capacity! Ok so what does this mean? This battery pack simply enables you run your iPhone 5 for 15 hours, plus 40 hours extra talk and an additional 150 hours extra of music for most mobile phones. That is amazing! You will never not know when the power pack needs to be re-charged, because Intelligent LED status bar will indicate the current battery status. Even has a built in flashlight for when you may need a bit of extra light! 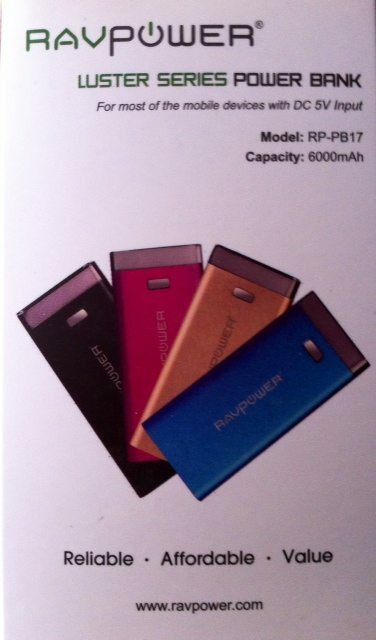 The power pack comes with: RAVPower Luster Power Bank, USB to Micro USB charging cable, User Instruction, Carry Pouch. 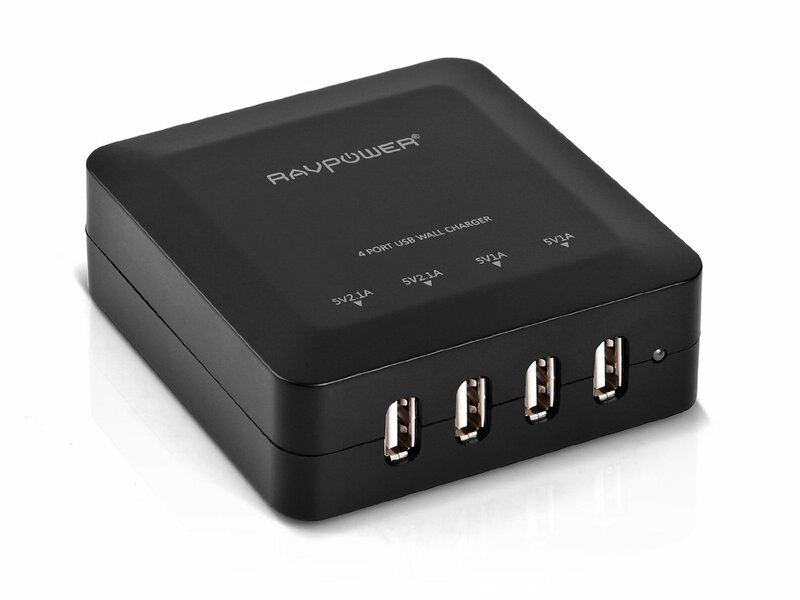 And on top of this Power pack, I was always graciously asked if I would try out the RAVPower 4 Port Wall Charger. This one charges multiple smartphones or tablets at a time, 4 to be exact! In my house that is also a huge bonus, because my husband and I together each have our own iPhone and iPad, plus I have a Kindle Fire, too. So that is 5 different devices, that need to be charged vying for different electrical outlets to charge. This charger allows that we can charge 4 out of the 5 items on one charger that is plugged into one electrical socket. No more fighting and vying for who will get to charge what, when, where or how. 4 ports (as I said already), which are designed to charge iPad and tablets, iPhone and Android devices all at once. Designed for it to be portable to be taken wherever you need to charge your devices. Well made and built with Industrial-grade plastic outer shell and premium circuitry ensure lifetime reliability. AC 110-220V input voltage ideal for international travel. This is important as many traveling abroad might know already. 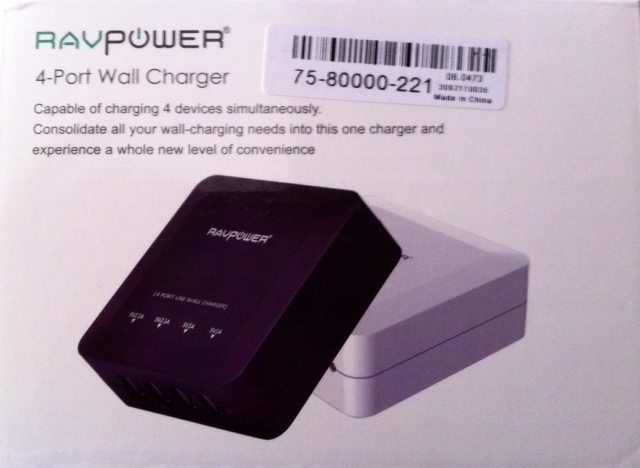 The charger package comes with the RAVPower® 4-Port Wall Charger, 3.84ft / 117cm detachable power cord, and user manual. Simply put as long as your device is USB compatible, you should and can charge it using both of these devices. I have to admit, both my husband and I are so happy and have now used both numerous times. So, I am truly happy to share this with all today and would highly recommend either or both or these chargers for those looking for faster, better or easier way to charge all their USB compatible devices. Now, if we ever do lose power again (god forbid), at least I am prepared for it with RAVPower! And last but not least, thanks to RAVPower, one of my luck readers has a chance to win their very own RAVPower External Battery Pack Portable Charger. All entries with be verified and only open to those in the US. « The Jury Is Still Out On February! You convinced me – I need one!! We've been through hurricane power outages too. No fun at all!! This is a great/very useful item to share, Janine! We don't lose power often, but we have been out after a bad storm for as long as 26 hours. It was rough! The wireless charging mat sounds very cool! My recent post How’s Your Staging Area? What a great idea. This would be perfect when your power goes out or just to have extra in your purse. Holy cow, you really needed something like this. I can definitely see the point of having it around! It's awesome. These chargers are great. I would have chosen the pink one too!! I entered and I sure hope to win!! Thanks for the review, Janine, and have a wonderful week. I love my RAVPower charger. I didn't realize they had one with 4 ports. Excellent. Does it last as long as the one port charger? My recent post How Will You Celebrate Random Acts of Kindness Week? So funny, we were looking at external batteries/chargers this weekend! So I still need one J! I want one so badly! Another Jennifer had this giveaway and it was right before my trip, but I didn't win. Boo! I want the RAVPower Qi-Enabled Wireless Charger Charging Pad (black). And we didn't lose power from any of the hurricanes, but the freak blizzard two years ago got us bad! My recent post I Wanna See You Be Brave. 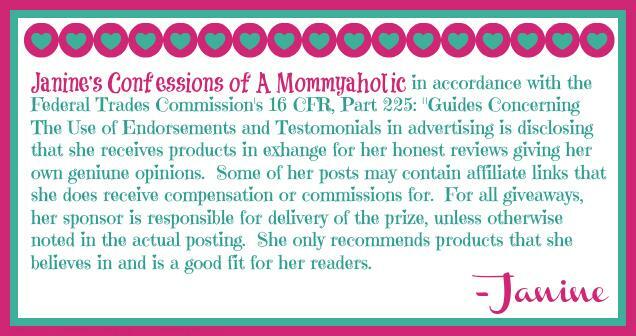 I am so sorry I won that one and then a few days later I was contacted to review one. I figured I could pay it forward and am raffling the other one off now, because I felt so guilty. I hope you entered and fingers crossed that this time you win!! 🙂 xoxo!! It was you! Well I'm glad it was. This would be a lifesaver especially with all the traveling I do! Wow – that product sounds awesome – many days when I'm out all day for work I feel like I have to ration my phone use – this would help for sure! I definitely want one! it's so easy to run out my iphone battery when I'm on the go! That would be soooo useful! And not just for power outages! I have the worst habit of forgetting to plug my phone in and having it die on me when we're out! I love this charger too…I am wondering now what I ever did without it! wow…that is so cool, I think Tony gave me something similar, but it only charges one phone at a time…this is way cooler and so going to give this as a xmas gift to him next year. I like the luster series. It would be perfect for my upcoming cruise! Thanks Aunt Gloria and just trying hard to stay warm and safe. Hoping Spring find us up here eventually now! xoxo! !